In 1969, Corning released the Floral Bouquet Limited Edition Gift line. Due to it's popularity, Corning decided to continue producing the pattern in 1970, though in a slightly modified form. This, to us collectors, has become known as 2nd edition Floral Bouquet... Though at the time, it was still called "Floral Bouquet", just like the Limited Gift line had been. The modifications were fairly simple... First, the special ceramic knob lids used on the Gift line were replaced with the standard clear glass Pyrex lids. Secondly, the pattern was altered by using a solid yellow background instead of a linen looking texture and the flowers were accented with blue and avocado colors to make them stand out more. Thirdly, the line was expanded slightly by the addition of a 10 inch skillet and a 1 quart saucepan. This version of Floral Bouquet would remain in production until mid 1971, when the 3rd edition of Floral Bouquet would be released. P-1-B Saucepan with P-7-C lid. Though there is a percolator to match this set, it wasn't released until 1971. The percolators for Floral Bouquet (2nd & 3rd editions) are exactly the same. All 9/10 cup percolators have a significant amount of yellow in the background of the front medallion (for the pattern does not wrap around like Renaissance does). These include the P-149 stove top and the P-80-EP & E-1210 Electromatics. All the 6 cup percolators, however, have a small single patch of yellow between 2 of the flowers. As far as I can tell, there were only two 6 cup models produced. The P-146 Stove Top and the P-6-EP electromatic. 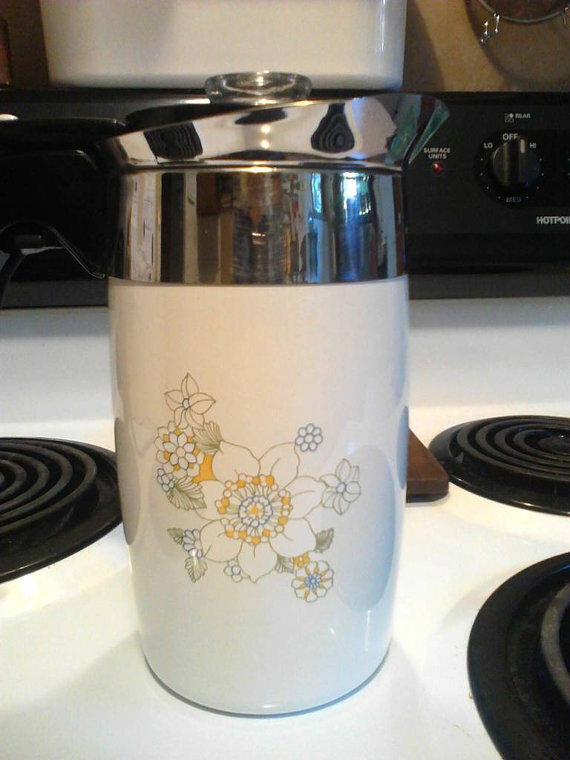 No matter when the percolator was produced (1971-1974) it is the size, not the edition, that determined the pattern. For this reason, I usually leave them out of the "Editions" list... Aside from the Original Gift line P-119, they all look the same.